Bring Capoeira to your school! Group Senzala offers free demonstrations to schools and community groups through out the UK. Capoeira is a fantastic activity for children as it empowers them in a number of different ways. It helps to burn the extra energy of the more active ones and it stimulates and builds up the confidence of the more introspective ones. It fuels their imagination as they learn to communicate through acrobatic and “attack” “defense” moves. The need to interact in pairs and as a group through out the class will reinforce their social skills and the concept of teamwork. 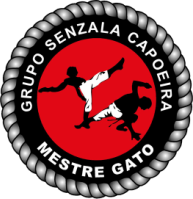 It will improve their coordination as they learn new moves and how to play the instruments of Capoeira. It will teach them about mutual respect and unlike other martial arts, the aim is not to win or hit the opponent but rather to work together transforming movements into something new. They will sing and learn stories through songs that will expose them to a foreign language and culture without even realizing it.